Limited edition head piece for 16 Braunton, in a stunning Art Deco style head piece, this sits on the forehead hair line with the swirl detail on the fore head, it sits around the head and is secured at the back with a necklace type fixture lobster clasp with elastic and has loops for bobby pins to secure further if needed. This is an amazing piece encrusted with twinkling Austrian crystals on a rhodium plated metal. 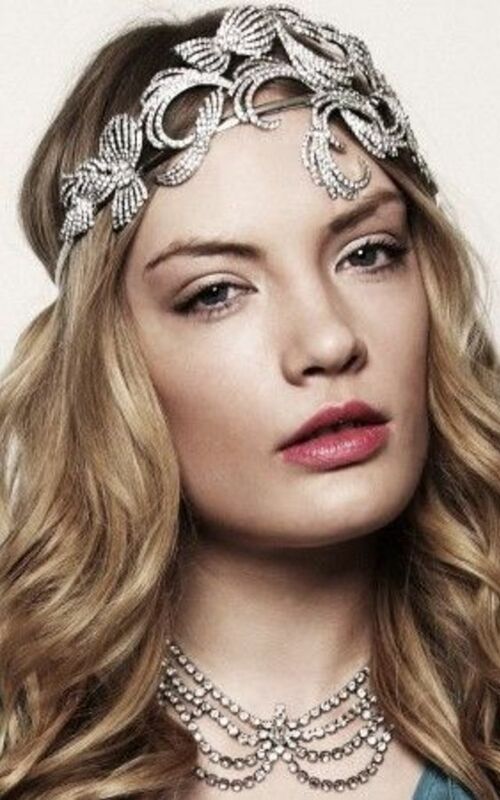 This piece can be turned around and worn as a head band with the swirl detail at the back. Beautiful sparkly Austrian crystals in the highest quality really make this piece stand out for weddings, proms and evenings out. Can be worn with hair up or down. great for ethereal dressing up and festivals.